Facebook has launched their Facebook Camera app for the iPhone today – and it’s available in the App Store now. This app release is just a little over a month after Facebook bought Instagram, makers of the massively popular photo effects / sharing app. It’s a free app of course. I just installed it a few minutes ago and my lightning first impression is it’s a very Facebook-y looking app, nowhere near as pretty or simple as Instagram – but that’s hardly a shocker. It will be very interesting to see how this app fares. 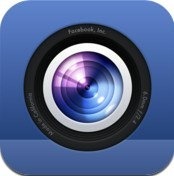 Here’s an App Store link for Facebook Camera. Once you get a chance to try it out, let us know in the comments what you think of this app, and how it compares to Instagram.